Frozen shoulder is a condition in which shoulder joint stiffens and significantly diminishes the range of shoulder movement. The inflammation of the muscle tissues around the shoulder joint makes it stiff and restricts stretches and other movements of shoulder. This is also known as adhesive capsulitis as adhesion forms sticking the joint surfaces and decreases the space available for lubricating joint fluid. Freezing, or painful stage: The shoulder becomes stiff and then very painful with movement. Movement becomes limited. Pain typically worsens at night. Frozen, or adhesive stage: The shoulder becomes increasingly stiff, severely limiting range of motion. Pain may not diminish, but it does not usually worsen. Thawing stage: Movement in the shoulder begins to improve. Pain may fade but occasionally recur. Pain in shoulder while performing normal, everyday work – wearing shirt, taking bath, brushing, coming hair, folding cloths, lifting light weights etc. Diagnosis: Diagnosis for this condition is clinical. And based on the symptoms one have doctors will suggest further test including X-ray, MRI, arthroscopy, blood tests etc. Treatment: Restoring shoulder movement is the main goal of the treatment. Gentle shoulder exercises are recommended. Physiotherapist, based on your shoulder degree of movement will help to perform several exercises. This include: passive stretching by physiotherapists and weighted pendulum exercises. Anti-inflammatory medicines that are non-steroidal will help to reduce pain caused by inflammation. TENS is Transcutaneous electrical nerve stimulation helps to bring relief by blocking pain impulses. Manipulation of shoulder under local or general anesthesia is one of the option if other treatments does not help. Shoulder arthroscopy: This is a minimal invasive surgery where a small endoscope, is inserted through a small incision into the shoulder joint to remove any scar tissue or adhesions. Never sleep on the side of the shoulder that is frozen as it increases pain. Do not use a pillow and soft mattress if you have frozen shoulder. Garlic and mustard oil therapy: Crush 2 or 3 garlic cloves and add to mustard oil. Cook this mix for five minutes on low heat. Remove and apply the oil mix to shoulder and massage in circular motion. 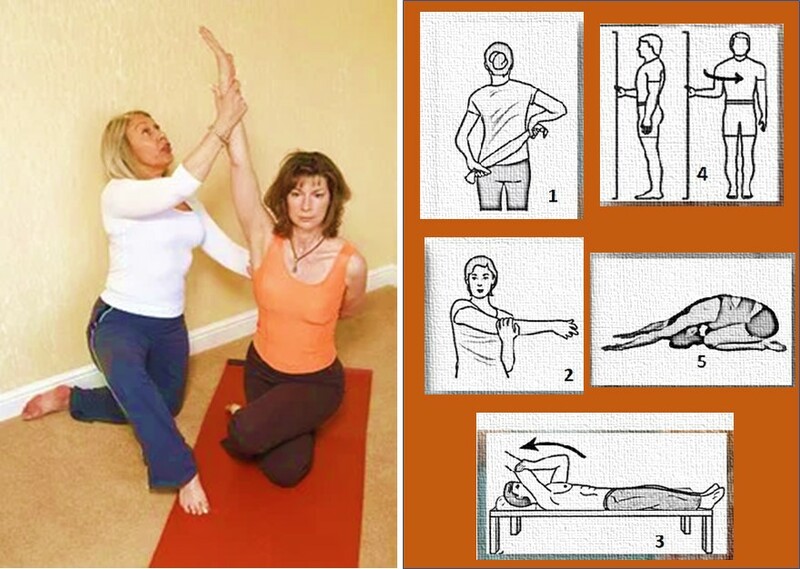 Towel or strap stretch – By holding towel in both hands at the ages move the arm up and down at back. This stretches the shoulder. Forward flexion — supine position. While sitting straight or lying on your back with your legs straight- Use your unaffected arm to lift your affected arm overhead until you feel a gentle stretch. Hold for 15 seconds and slowly lower to start position. Relax and repeat. External rotation — passive stretch. While standing in a doorway, bend your affected arm 90 degrees to reach the doorknob. Keep your hand in place and rotate your body slowly in the opposite direction. Hold for 30 seconds. Relax and repeat. Shoulder flexion stretch – Like child pose of Yoga –Kneel on the floor and keep the hands in the same spot, lower your buttocks towards your heels. This increases the degree of flexion at the shoulder joint. Generally, it takes few months to recover from frozen shoulder. People may not show full recovery especially if they have high blood sugar. If not, it will take up to 18 months to recover. Good physiotherapy and proper exercises helps in total recovery. While taking steroidal injections one need to think about the risk factors involved as it may cause complications later. Surgery shoulder also has many consequences one need to think about. It may lead to muscle wasting and recurrent adhesions later. During manipulation of shoulder some patients may lose excess adhesion resulting in fracture bone – especially with elders this can happen. IF you have pain in shoulder and have limited movement contact your doctor and seek suggestion before the condition advances.